A strong 6.9 magnitude earthquake, at a depth at 29 miles, struck off the Philippines Monday, southeast of Bacolod in the Negros islands at 0349 GMT, the U.S. Geological Survey reported. Aftershock: A 6.2 aftershock jolts the Negros, Cebu region at 10:10am GMT(06:10pm Local time). 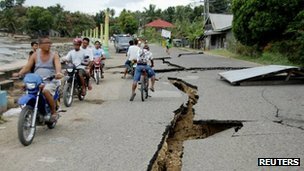 Rescue efforts are continuing after Monday’s powerful earthquake in the central Philippines that left at least 15 dead and 44 missing. ”The most urgent needs now are water, tents and food,” he said. The quake hit 70km north of Dumaguete city on Negros island. As of 08:00 local time, the toll was 15 confirmed dead, 44 reported missing and 52 injured, according to an official report. The death toll includes two children, according to the government’s National Disaster Risk Reduction and Management Council (NDRRMC). But this report has not yet been confirmed by the central authorities. In the town of Guihulngan, about 90 km north of Dumaguete, reports said some houses had been completely buried by landslides, and the market and court house were also damaged. The town’s 42-strong police force, joined by army personnel and volunteers, had been searching for survivors and clearing debris, said Inspector Alvin Futalan, police chief of Guihulngan. “The army (troops) had to walk about 50 km from the last stop reachable by vehicle to reach us,” he told the Agence France Presse news agency. “We’re now getting shovels and chain saws to start a rescue because there were people trapped inside. Some of them were yelling for help earlier,” La Libertad police chief inspector Eric Arrol Besario told the Associated Press by phone. One child died and a local tsunami alert was issued after a magnitude 6.7 earthquake followed by two aftershocks struck off the Philippines island of Negros on Monday, according to the U.S. Geological Survey (USGS) and a local monitoring service. The Philippines Institute of Volcanology and Seismology said it warned residents along coastal areas to be on the watch for unusual waves as it raised a tsunami alert at level 2. The institute also warned structurally weak buildings may sustain damages. The U.S. Pacific Tsunami Warning Center said that based on all available data a Pacific-wide tsunami is not expected. The quake, with depth of about 10 kms (6.2 miles), according to the institute, and centred just 5 kms off the shore of Tayasan, Negros Oriental, was felt at intensity 7 in Dumaguete City and intensity 6 in Bacolod City, according to the institute. The USGS put the quake at 6.7 in magnitude and a depth of 12.4 miles (19.8 kms). Two aftershocks, of 4.8 and 5.6 magnitude on the USGS scale, followed within 30 minutes of the earthquake. “Damage is possible in areas hit by at least intensity 5 and if the buildings are structurally weak,” Renato Solidum, head of the volcanology and seismology institute said in a radio interview. A child was killed in Taysan town in Negros Oriental after a concrete wall collapse, pinning the helpless child to death, reported the National Risk-Reduction Disaster Management Council. NRRDMC executive director Benito Ramos said initial reports showed that the child, whose gender and identity has yet to be determined, died after the wall collapsed onto him. He said he has received a report that earthquake shattered several glass panels of a shopping mall in San Carlos City. While the tsunami alert was raised, Ramos said the possibility of its occurrence is very slim.